When the mythical once & future King Arthur Pendragon retreated with 12 of his knights to a mountain cave, to lie asleep and awaiting the clarion call to arise and come forth to Britain’s aid, I very much doubt he suspected he’d be re-incarnated in the twentieth century as a “mad biker Druid Eco-warrior cider-belly King of all Britain, with knobs on it”. This updated and revised biography of our modern-day King Arthur tells the story of the wild west-country biker, previously known as ‘Mad Dog’, ‘Geronimo’, ‘Ace’, or ‘Wolfdog’, who changed his name by deed poll to King Arthur Pendragon and stepped up to the defence of Albion. 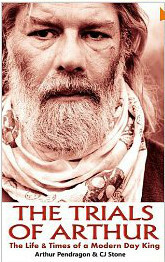 As is fitting, Arthur’s life story reads like a comprehensive study in British environmental activism in the late twentieth century – As well as the battle for free public access to Stonehenge at the solstice, King Arthur and his Loyal Arthurian Warband claim a presence at a string of significant road protests sites – “Twyford Down, Highworth, Whatley Quarry, Seahenge, Third Battle of Newbury, Stringers Common, Dead Womans Bottom, Canbury Gardens, Crystal Palace”. It is clear from this biography that Arthur’s name-change went beyond a clever and newsworthy protest-prank, a re-enactment stunt for the early evening local news, our real-life Arthur has made a positive impact on the neo-pagan movement, particularly in Druidry. And Arthur himself admits to acquiring “shed-loads” of magical titles: he is an initiated Druid, and a Wiccan, and a Priest of Merlin, and so on. You can check them out in the appendices at the back of the book. The Trials of Arthur is both an autobiography and a joint authorship project, and I can sense the chatty, convivial voice of King Arthur echoing in some passages, full of the embellishments and hooks of an accomplished storyteller, a natural raconteur. King Arthur’s co-author, C J Stone, is cast in the book as a bard, a scribe, an august, ancient and magical role, a weaver of myth. As the author of Fierce Dancing, The Last of the Hippies and Housing Benefit Hill, C J Stone is already an established champion and humanistic observer of the underdog, the marginal, the self-imposed outcast. His writing is amusing, well-paced and light in touch, as he describes events that are often quite surreal in clear, unfazed words. All in all, The Trials of Arthur is a pleasurable, easy-going read that is shot-through with serious insight and philosophy. I would recommend it even if you’ve already read the 2003 edition, this new edition reads like a more thoughtful, weightier book. One notable innovation is that the chapters follow the 8-fold year and include charming descriptive seasonal passages that don’t appear in the previous edition. A schema of the 8-fold year is included in the generous swag of appendices; as is a glossary explaining jargon such as ‘bender’, ‘freegan’, ‘brew crew’ and ‘digger-diver’. Another appendix is “The Royal Tour – King Arthur Pendragon appearing at a courthouse near you“, which chronologically lists King Arthur’s arrests at various protests. I very much enjoyed reading this updated Trials of Arthur, it’s funny and cheeky, and captures the spirit of irreverent creativity that finds expression in the roads protest movement. Jean Dark is a solitary hedgewitch, who is currently stewarding a derelict garden. she has written book reviews and articles for a number of pagan publications on tarot, folklore, plant lore, labyrinths, and bookbinding.